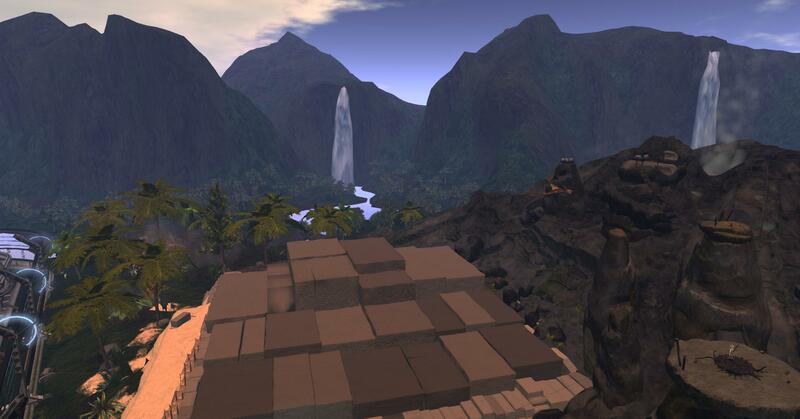 PaleoQuest: Second Life’s Dinosaur Adventure! As most of you know, I’m a huge MadPea fan. 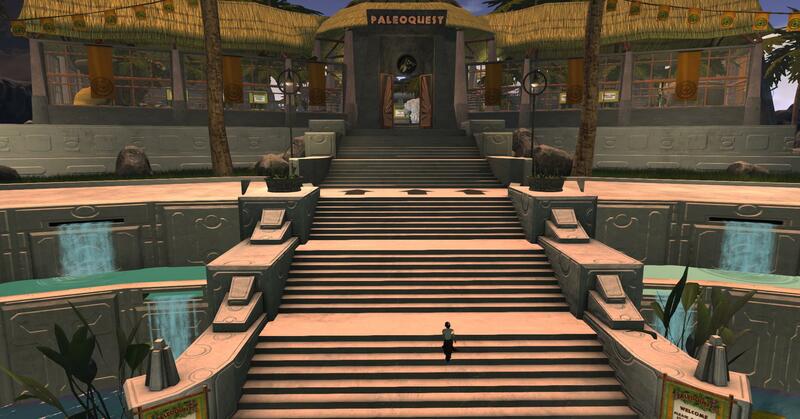 But recently I’ve discovered a Linden Lab created game that was just opened called PaleoQuest. It’s a skill game (along the same lines as MadPea but certainly not to their level). I started it tonight and couldn’t make it through the First Quest; I kept getting killed. It’s getting late so I will try again another day. However it’s fun and interesting, and I need to figure out how to avoid the traps. Meanwhile, I encourage you to try it out for yourself. I strongly recommend you use the game settings they suggest — it makes a difference. And of course, the game takes advantage of the Experience Keys — one click to allow the HUD and game to control your avatar and no more clicking. Welcome to PaleoQuest. This is a fully interactive game, where you can take part in adventurous quests, collect various common and rare objects to help Magellan close the time anomalies, avoid perils, dinosaurs, and foil Dr Talpa’s evil plans to take over the grid! Receive prizes and L$ rewards for your bravery! Welcome to PaleoQuest. This is a fully interactive game, where you can take part in various quests, and earn L$ or prize rewards. – Current game information and clues. – How many common and rare collectible objects you have collected. – Which Artifact quests you have completed. – Hands out a help notecard. – Has a mute button, in case you wish to mute the audio clues that the HUD plays. The first building you enter is the Visitor Center. – A tutorial video to play. – A background story video. – The Paying Out Stations are located in the left and right wings of the Visitor Center, and are clearly sign posted. – Here you can REDEEM your Collectible objects (FOR L$) and completed Artifact quests (FOR L$ OR A RANDOM PRIZE). – Prizes are given out randomly from the Prize Payout Station, and are tradeable. – Please rez your prizes on a sandbox, or on your own land. – Stairs to the monorail are located at the sides of the entrance to the visitor Center. – Follow the signs to the monorail start platform. 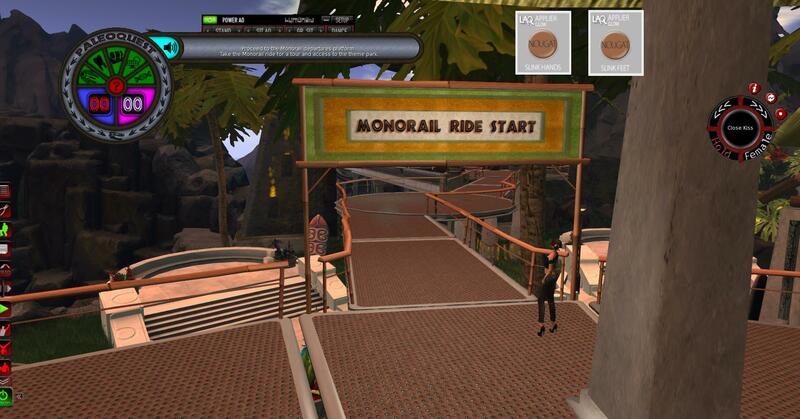 – Ride the monorail to take a tour of all the regions. – At each monorail stop, there are quests to play. – Touch the quest information signs to find out what the quest for that region is. – If the Monorail is not working, please use the Teleport Pads to go from stop to stop. – Once you leave the start region, each region has a series of common and rare objects to collect. – Blue = common; Pink = rare. – Rare objects are located in the most dangerous places. – You can carry a maximum of 99 common and rare objects. – When you are carrying the maximum amount of objects, you need to return to the Visitor Center to hand them in for L$ rewards. – Stand on the “Collectible Payout Stations” to automatically get a payout for your objects. – You cannot hand in FEWER than 20 common or rare objects. – You can hand in a maximum of 200 common blue objects, and 100 rare pink objects, per day. – There are 5 regions where you can take part in Artifact Quests, and collect artifacts. – Depart from each Monorail stop, and click on the quest sign to find out what you have to do for each quest. – If you find a key object to complete a quest, and it attaches to you, DO NOT DETACH IT UNTIL YOU COMPLETE THE QUEST. – Once you have completed the first quest, the icon lights up on your HUD. – Once all 5 artifact quests have been completed, and all icons are lit up on your HUD, you may return to the Visitor Center, and can then choose a L$ reward, or a random prize, by standing on the relevant platform. – You can complete the Artifact Quests (must be in consecutive order) once a week. – When you die, you get teleported to the nearest resurrection circle. – You lose everything you have collected. – You do not lose any artifact quest progress. – Moving faster than the standard Second Life run speed. – Being idle for over 9 minutes. – PaleoQuest is a game involving skill. – Take your time, observe your timing, walk, jump, run, look around carefully, and listen. – Remember to always watch your step. – Always read the text messages on your HUD. – There are also audio messages, and signs to touch for more information. – If your audio message repeats, click on the mute button on your HUD, and then unclick it. – Sometimes it is better to complete the quests, and then collect the collectibles afterwards. To get started, please watch the videos, and then make your way to the Monorail start platform. Stairs to the monorail start platform are located behind you, and are clearly signposted. Your adventure awaits! 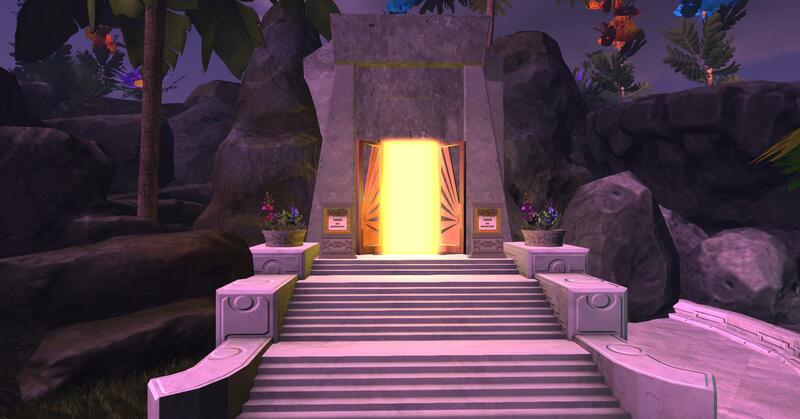 The portal to enter the game. The Monorail that takes you to the quests. Make sure you get on the Monorail at the Start Gate. The Monorail and surrounding views. 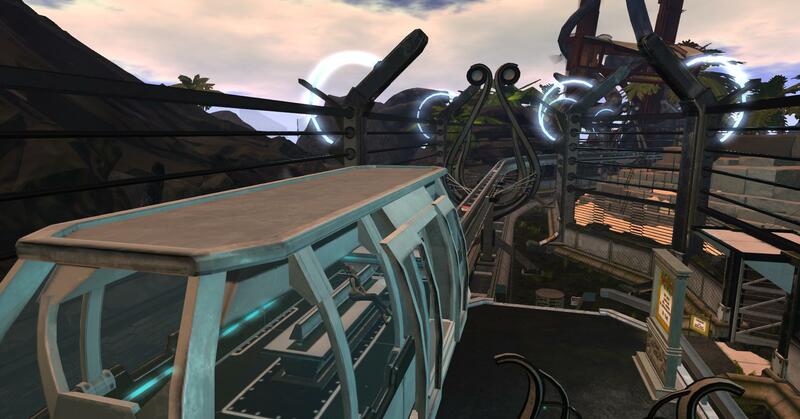 Here’s the SLURL to the Portal Park. 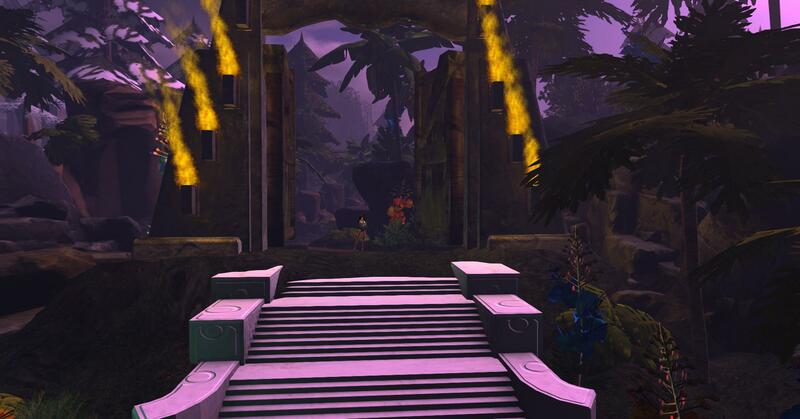 Find the PaleoQuest entrance, and off you go! 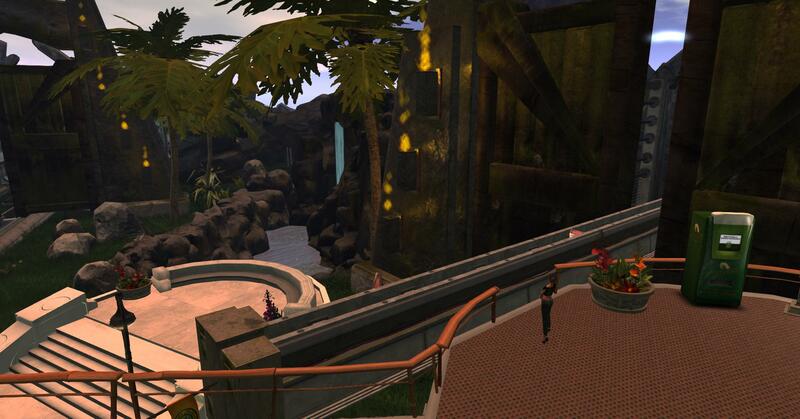 This entry was posted in EVENTS and tagged games in Second Life, Linden Lab, PaleoQuest, Second Life, ZoHa Islands. Bookmark the permalink.